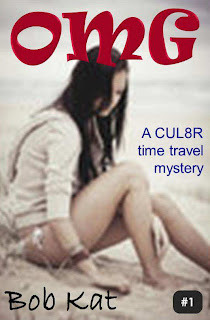 OMG is a fast-paced time travel action adventure about four teens who travel back to the past to solve a mystery and save a life but end up risking their own. OMG begins when Kelly moves to Fort Myers Beach, Florida to live with her aunt and finds hidden treasures and secrets. She quickly becomes friends with her quirky next door neighbor Scott who has a reputation as the school’s number one geek. Scott’s best friend is Austin, the hot and popular quarterback. He joins Scott and Kelly as they embark on an adventure after Scott invents a way to travel back in time to find a girl who has begged for their help. They solve the mystery, but are then faced with the dilemma of whether or not to right a wrong or to let history stand. The four end up on the time travel adventure of their lives.